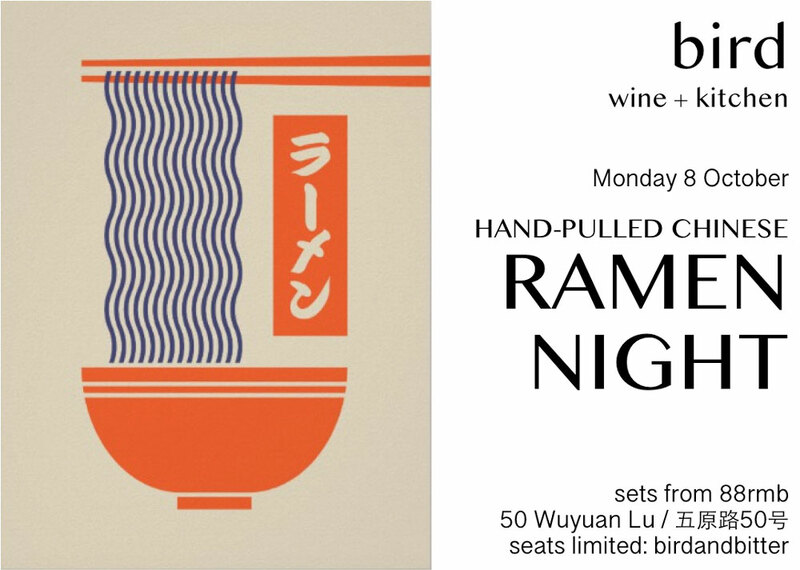 Bird has a one-night Chinese ramen pop-up with a street noodle guy pulling delicious noodz. Sake and whiskey highballs will pair nicely with the ramen sets. Just make sure you message them to make sure they have space for you. Oct 8, from 6pm, from RMB88. Bird, see event listing. 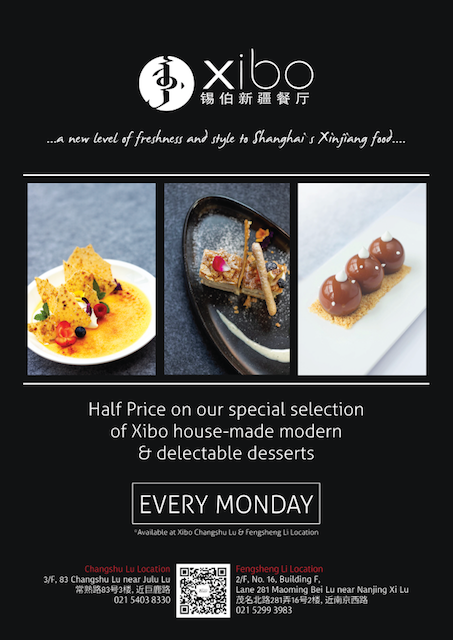 If you like the food at Xibo, you will love their desserts; especially on half-price Mondays. Their house-made sweet treats are a delectable ending to your meal. We are particular to the carmelized cheese balls, but the warm chocolate lava cake, flamed ice cream and badamu parfait are also tops. Oct 8, all day. Xibo, see event listing. 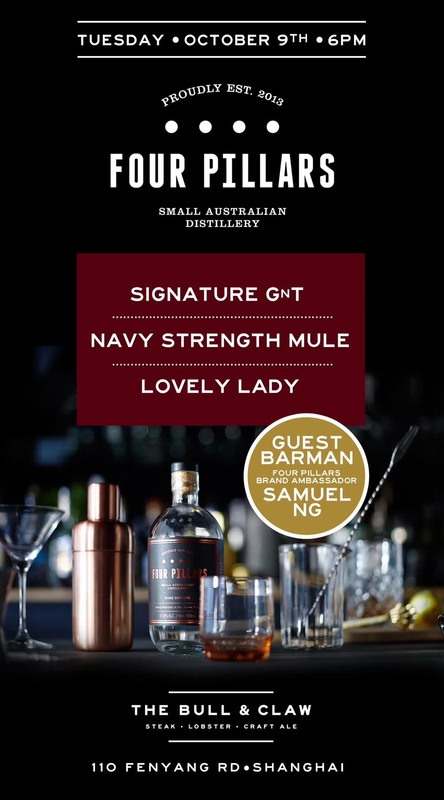 For only one night, Four Pillars Gin Ambassador Samuel Ng is taking over the bar at The Bull & Claw. Expect unique libations made from rare flavors such as Bloody Shiraz and Spiced Negroni. They also have unflavored gins of the regular and super strong variety (they call that one Navy Strength, ahoy sailors!) Try them in signature the GnT, Navy Strength Mule or Lovely Lady cocktails...or straight from the bottle. Oct 9, 6pm. The Bull & Claw, see event listing. 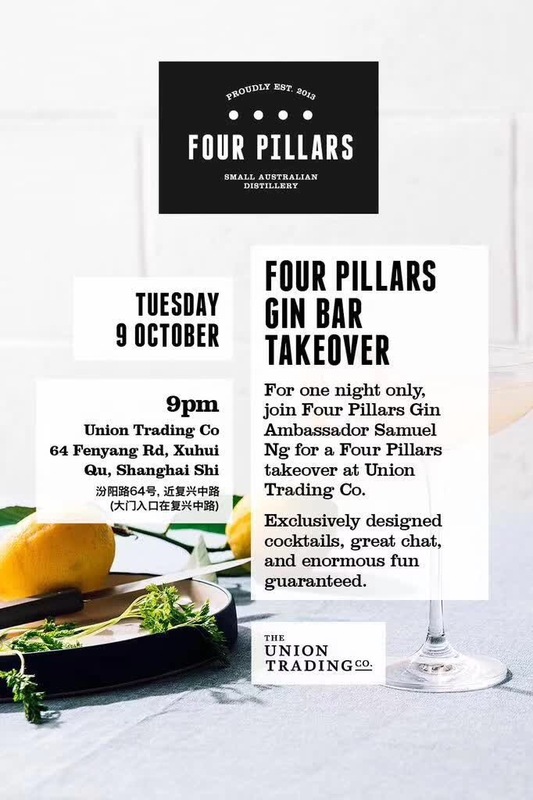 For only one night, Four Pillars Gin Ambassador Samuel Ng is taking over the bar at Union Trading Co. Expect unique cocktails created in collaboration with UTC's main man Yao Lu made from rare flavors such as Bloody Shiraz and Spiced Negroni. Four Pillars, a craft gin that is batch distilled in Australia's Yarra Valley, is definitely worth a try. Oct 9, 9pm. Union Trading Company, see event listing. 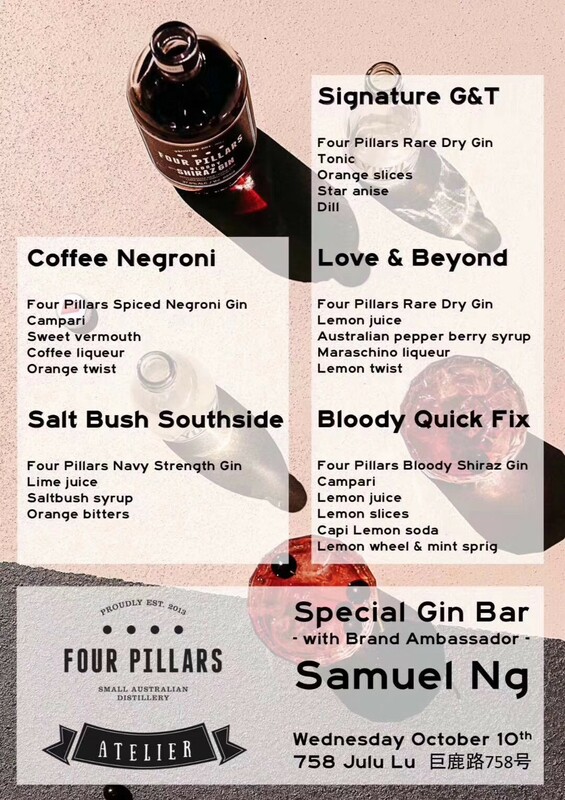 Four Pillars Gin Ambassador Samuel Ng will be spending the final night of his Shanghai visit pouring gin cocktails at Atelier. Expect unique libations made from rare flavors such as Bloody Shiraz and Spiced Negroni. They also have unflavored gins of the regular and super strong variety (they call that one Navy Strength, ahoy sailors!) We highly recommend the Bloody Quick Fix featuring the brand's Bloody Shiraz gin and Campari. Oct 10. Atelier, see event listing. Did you know that an estimated 300 million people are affected by depression worldwide? Or that suicide is the second leading cause of death among 15-29 year-olds? These facts (courtesy of the WTO) make mental health awareness increasing important for everyone. 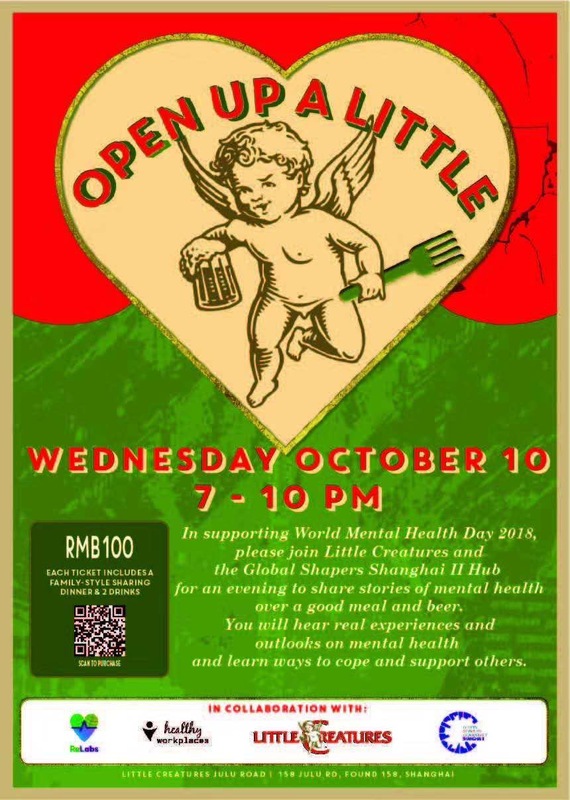 Join Little Creatures and the Global Shapers Shanghai II Hub for a dinner event aimed at sharing stories of mental health over a comforting meal and a few beers. Facilitators Tasha Heipel and Ben Ivey will be touching base with each table to introduce topics as well as share coping mechanisms and resources. Oct 10, 7-10pm, RMB100. Little Creatures Brewer's Lab, see event listing. Crystyl Mo's Food Culture Series is back by popular demand. This installment, in collaboration with Shanghai Gastronomy Club, takes place at the luxurious Bellagio Shanghai. 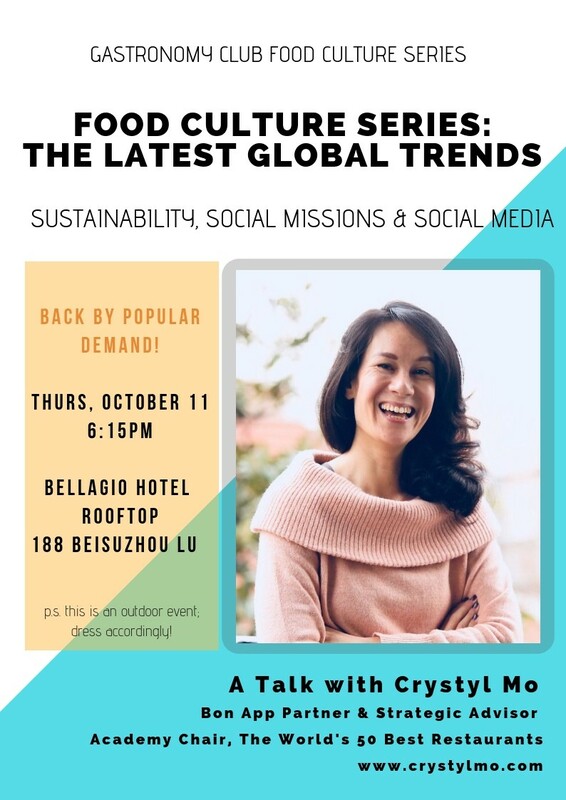 After giving talks at naked Hub Shanghai, W Suzhou and Blue Hill at Stone Barns in New York as well as covering Rene Redzepi’s MAD Symposium in Copenhagen, superstar chef Ana Ros’ breakout restaurant Hisa Franko in Slovenia and Vladimir Muhkin’s White Rabbit in Moscow, Mo is ready to discuss internation food trends with you. Included in the ticket price is a food adventure by Via Stelle, a glass of Prosecco by BottlesXO and water by Earth Water. Additional red wine, white wine and Prosecco available at just RMB30/glass. Oct 11, 7pm, RMB198 (presale), RMB250 (at the door). Bellagio Shanghai, see event listing. 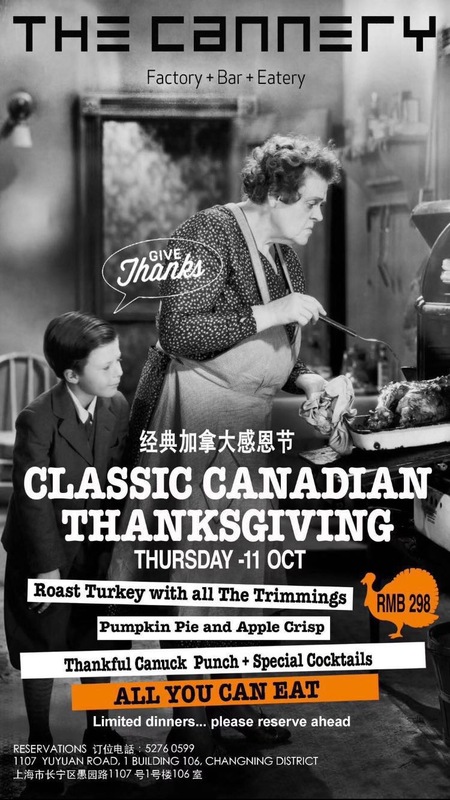 Have a very classic Canadian Thanksgiving with roast turkey with all the trimmings, pumpkin pie, apple crisp for dessert plus Thankful Canuck punch and special cocktails. You won' t go hungry hear, because it is an all-you-can-eat spread. Don't forget to make a reservation as the number of diners is limited. Oct 11, RMB298. The Cannery, see event listing. This October set sail for The West Winds Gin Terrace pop-up at Circo in Columbia Circle. Enjoy those perfect Autumn evenings with a curated selection of The West Winds Gin to be enjoyed with Two Tall Brothers for one of the best G&Ts you will ever have. Acoustic music, casual antipasti and a historic venue complete the experience for sailors stuck in Shanghai. Oct 5-7, from 3pm. Circo, see event listing. 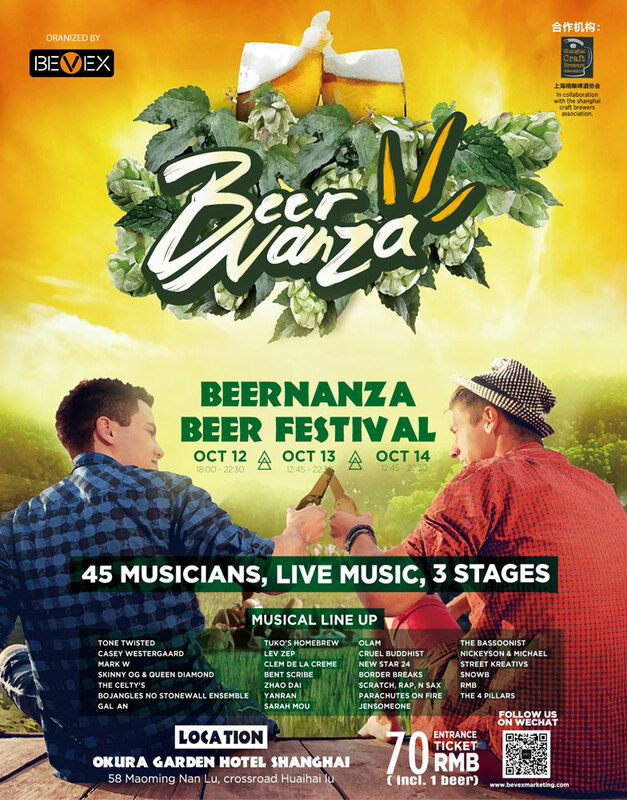 The fifth edition of Beernanza returns to Shanghai with three days of booze and music, including more than 150 Chinese and international craft beers. You can also expect a home brewing class, plus dozens of live Shanghai bands, including Skinny OG & Queen Diamond, JenSomeone, Yanran, Sarah Mou and more. Other exciting activities include a homebrew class put on by the Shanghai Craft Brewers Association as well as boxing fitness, Zumbhearts and Hip Pop Dance classes by FitHearts Fit Fest. Signing up for the fitness classes costs RMB98 with Beernanza access and a free beer... or purchase food or beer from selected locations (Little Creatures, Tap House, Homeslice Pizza, Cyclo, Dodu, Dean's Bottle Shop, Grill and Chill) for free tickets. Oct 12, 6-10.30pm; Oct 13-14, 12.45-10.30pm, RMB150. Okura Garden Hotel Shanghai, see event listing. If you've ever wondered why Shanghai goes crab crazy ever fall, UnTour is back with their popular Hairy Crab feast to show you why. Discover the reasons Tang Dynasty poets immortalized these crabs in verse millennia ago with this hairy crab feast. 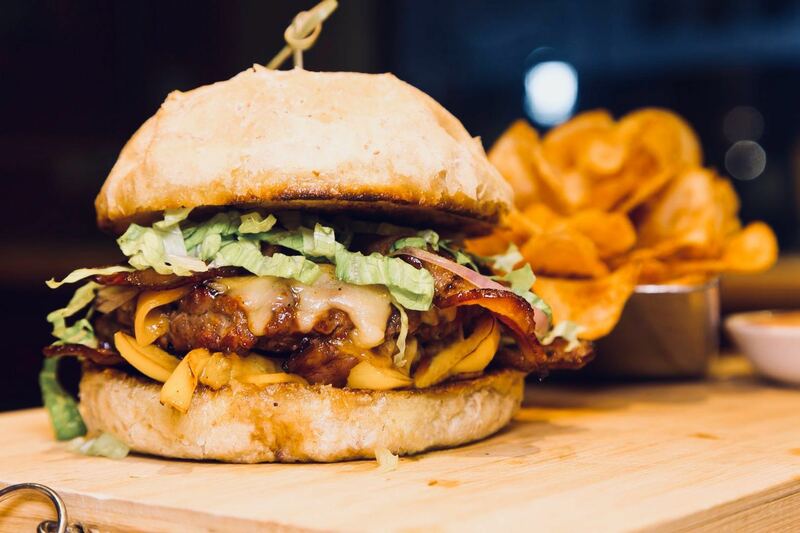 This tour's main focus is showcasing this local delicacy at two to three local eateries. You'll walk through the streets of Shanghai's disappearin Old Town lane by lane to sample several classic hairy crab dishes, including xiefen xiaolongbao (pure crab steamed soup dumplings) and crab roe wontons. You’ll also learn the multi-step process to cracking open the crab, and discover the Traditional Chinese Medicine reason why you should pair it with plenty of huangjiu (Chinese brandy). Plus this year they have partnered with Shanghai Young Bakers with all proceeds going straight to helping SYB sponsor their students' one-year training in bakery and pastry, because a little charity never hurt anyone. Oct 13: UnTour Shanghai, see event listing. Rioja Fantastico, a celebration of Spanish food and wine, is back at La Maison this Saturday. 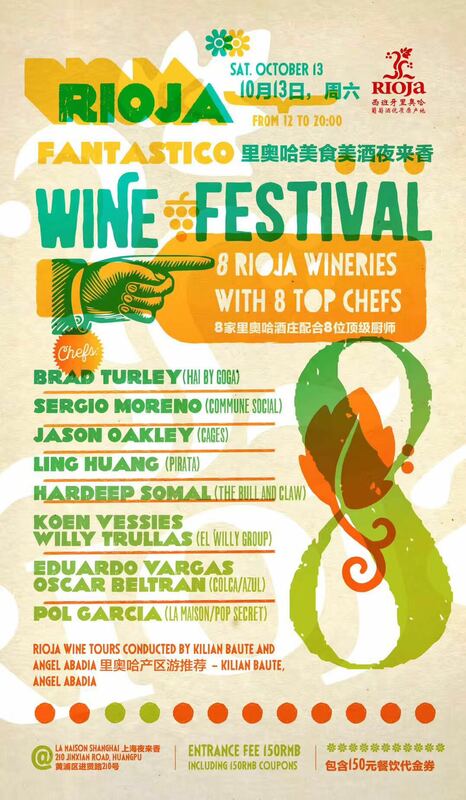 In this installment, enjoy eight varieties of Rioja wine paired with food from top Shanghai restaurants by chefs Brad Turley (Hai by Goga), Sergio Moreno (Commune Social), Jason Oakley (Cages), Ling Huang (Pirata, Latin Woo), Eduardo Vargas/Oscar Beltran (Azul, Colca), Pol Garcia (La Maison, Pop Secret) and Koen Vessies/Willy Trullas (El Willy Group). Rioja wine tours will be conducted by Killian Baute and Angel Abadia. Expect a real party cause they will have Flamenco dancing and more! Oct 13, noon, RMB150. La Maison, see event listing. Xibo has been busy adding weekly deals to their line-up, and you won't want to miss the da pan ji promotion. 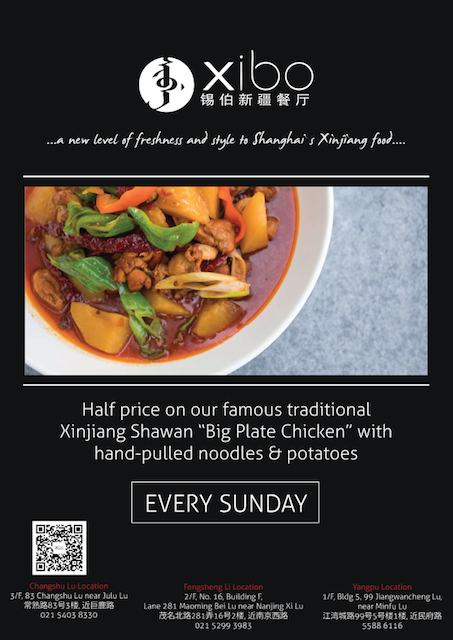 Every Sunday, the traditional Xinjiang Shawan 'Big Plate Chicken' with hand-pulled noodles and tender potatoes are half off the original price of RMB108. No reservations required and served all day, because they are casual like that. Oct 14, all day. Xibo, see event listing. The Plump Oyster and Botanik will be hosting an Oyster Festival on Sunday, October 14. At this fun foodie event, you will savor ten oysters from the hands of world-class shuckers: Daniel Notkin, Francois, Sequin, John Li and Even Li. Contact Agata Kulish to prepay for the event via QR code and prepare to enjoy pristine oysters pried open by true masters. Oct 14, noon-4pm, 4-8pm, RMB100 including ten oysters. The Plump Oyster and Botanik, see event listing. Learn to cook wholesome Chinese food with local chef Shiyin Wang. The course focuses on teaching traditional Chinese methods to cook healthy, mostly plant-based, whole foods. Dinner and wine are provided. Veggies are provided courtesy of Fields. Please go to the location listed on the flyer. Oct 14 at 6pm, Oct 16 at 7pm, RMB300. That's Territory, see event listing. 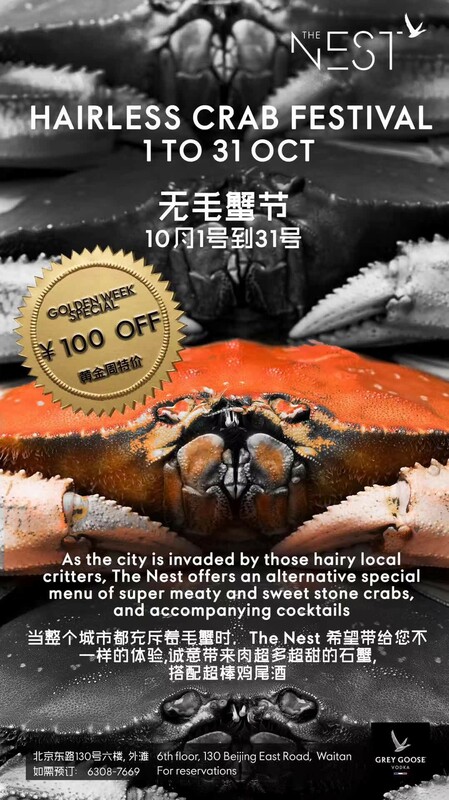 While the rest of Shanghai succumbs to the pleasures of eating hairy crabs, The Nest is offering an alternative 'hairless' sweet stone crab special. 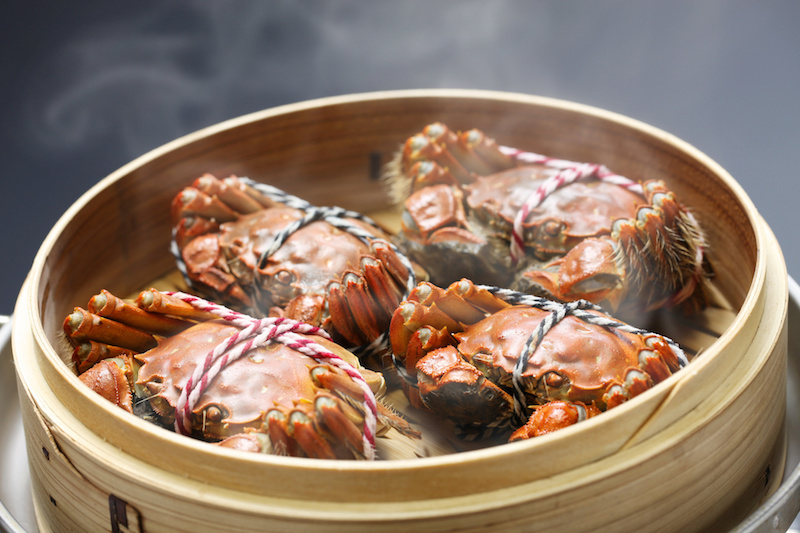 Each super meaty crustacean will be discounted to RMB398. Respect your crab as is with melted butter or choose from flavors including black pepper, flaming brandy, red hot chili and Handsome Han's special (ginger and wild garlic). There's also a short menu of special cocktails available for the occasion. Plus during the National Holiday all bottles are 50 percent off, so make sure to go this week. Oct 1-31, RMB398. The Nest, see event listing. Oktoberfest is a big deal at Geneva. The traditional German celebration call for a giant feast and this one showcases a 4-5kg suckling pig with side dishes and mini desserts. Free-flow is also an option, so go in hungry, get hammered and arrive home happy. 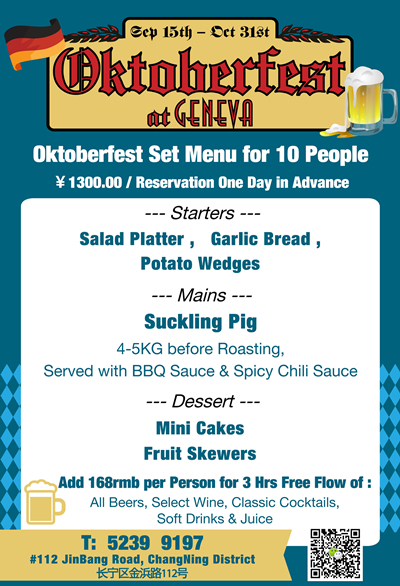 Until Oct 31, RMB1,300 for ten person set meal, RMB168 for free-flow beer, wine and cocktails. Geneva, see event listing. Get more Shanghai event guides sent directly to your phone (along with restaurant reviews, giveaways and other goodies) by adding Thats_Shanghai on WeChat, liking us on Facebook or subscribing to our weekly newsletter. If you have an event, upload it to our site through our User Center. It's free, it's easy and it's the best way to get into one of our Event Guides.